Tired of looking at tiny fabric swatches on a computer? 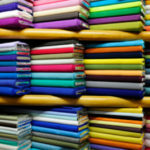 Decorating should be fun, and we make it easy with such a huge selection of in stock fabric to see and touch. 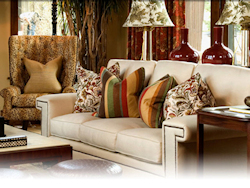 We can help you coordinate and drape fabrics together to get a true sense of how they will look and feel in your home. Let all the rolls of texture, colors and designs inspire you. Whatever you dream up, a simple accent pillow for your favorite chair, or completely decorate every room in the house. Please let us help make your house a home. 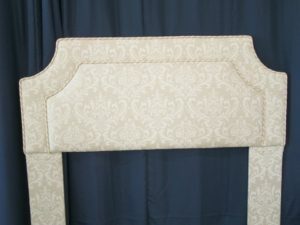 Our staff can create custom headboards and cornices or recover your existing ones. 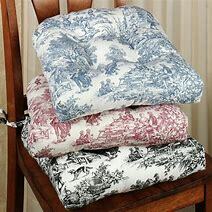 If you are looking for an accent pillow to bring life to a boring piece of furniture, or finish off the master suite with a series of coordinating pillow shams, throw pillows, and neck rolls. Look no further than New England Fabrics. See more of our pillows here. Faded cushions in the sunroom? Motor home cushions all musty and out of shape? We can create any type of cushion you need. Give us a try, we have access to all types of fillings from 100% down to different densities of foam. 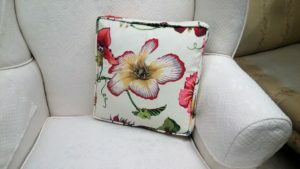 We can even re stuff your old flat uncomfortable cushions on your sofa. 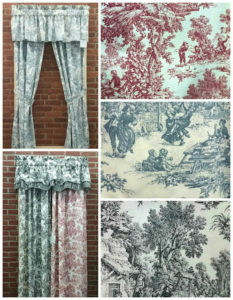 Beautiful “Made to Order” draperies, valances and shades. We can transform any window in your home into a showpiece you will be proud of. We make anything decorative for your bed. You wont believe your eyes when you let New England Fabrics create any or all of the following for your bed!